Syria Says It Is Pulling Troops Back, Activists Say Army Continues To Attack : The Two-Way On this day when a U.N.-brokered cease-fire was supposed to go into effect in Syria, activists reported military attacks on two towns even as the government claimed its military forces have begun pulling out of some areas. 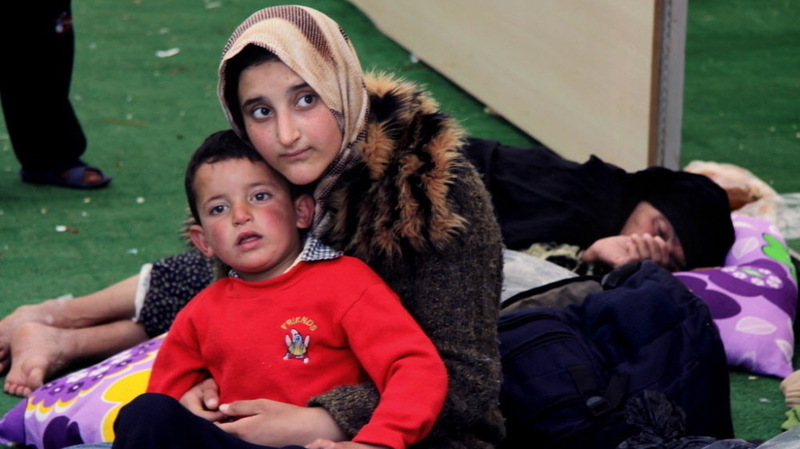 At a refugee camp in Reyhanli, Turkey, on Monday, Syrians sought help and safety. On this day when a U.N.-brokered cease-fire was supposed to go into effect in Syria, "activists reported military attacks on two towns ... even as the government claimed its military forces have begun pulling out" of some areas, The Associated Press reports. "Activists reported shelling in Homs and areas of northern Aleppo province, and unrest in the capital, Damascus. Syria's Foreign Minister Walid Muallem, on a visit to Russia, said Damascus had taken steps to adhere to the plan by withdrawing some troops. He blamed 'armed gangs' for the ongoing violence." Al-Jazeera adds that "the Syrian Observatory for Human Rights said most cities were relatively calm on Tuesday after heavy bloodshed in recent days, but reported no clear sign of troop withdrawals." Monday, the U.S. condemned reports of Syrian troops firing into refugee camps across the borders with Turkey and Lebanon — attacks that killed "a television cameraman in Lebanon and at least two people at a refugee camp in Turkey," Voice of America reports. An estimated 9,000 people have lost their lives in Syria over the past year during protests against the regime of President Bashar Assad, the U.N. estimates — most at the hands of government forces.